Products related to hook up of separate components, as a rule, are original: they have an unusual figure, and often unique shape. Knitting elements – the process is fascinating, but at the end of work before the seamstress comes the question of how to connect related motifs. Of course, you can combine knitted elements, just picking up the usual thread tonal stitching them with a needle. But in some cases it makes more sense to use a hook. The easiest way to connect parts of a knitted product is their fastening by means of a seam made by columns without nakida hook. To do this, hook injected into the loop of the last row both linked elements concurrently, then lend them through the working thread and provyazat 2 loops formed on the hook. The seam in this case is pretty solid, but neat. You can lay it on the reverse side, but you can with the front. It makes sense to do when knitting products, for example, from "Granny squares" or other that are large enough and dense elements. In this case, the connecting seam will serve as an additional decorative element. It can be done, for example, contrasting or different from the color thread to match. If this is the product of openwork squares, circles, triangles, or other repeating motifs, much neater it will look, if the elements are connected to each other in the process of knitting. As a rule, the diagram of the knitted element is connected motifs. Most often, the articulation of this kind is performed by means of arches of air loops. In order to add one element to the other, running half of the chain out of the stitches according to the pattern, then the hook is inserted under the arch and out of the stitches of the previous element and loop promazyvaetsya in the usual way, thus connecting the motifs. Further vivaselecta second half of the chain. The complexity of this method of connection is that the mistress in advance to calculate the necessary number of motifs and to chart their layout on the pattern. 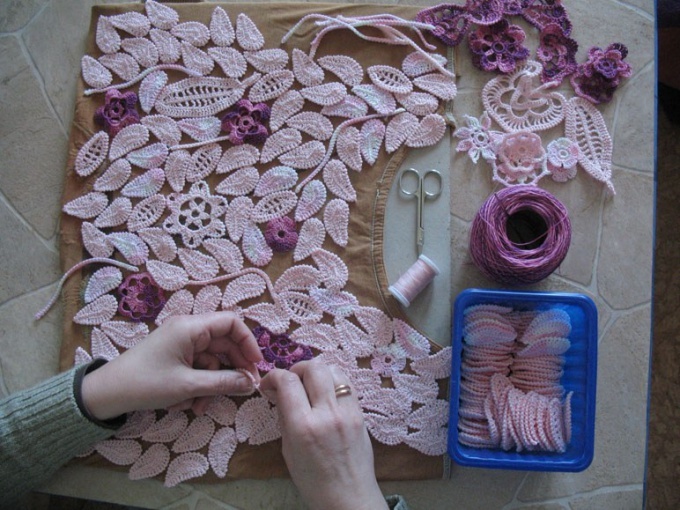 When creating products from small separate elements, for example, in Irish lace technique, sometimes combined elements, just stitching them to each other (coupling lace). Of course, it can be done with a hook, as described above. But in this case the knitted fabric is fairly dense and inelastic. This method of connection is suitable for knitting clothing. Much more common elements of Irish lace are joined by irregular mesh. This mesh, made a hook from a small (2-4 loop) chains of loops and columns with nakida. The General principle of implementation of such a network can be described as follows: from one element promazyvaetsya chain, which is fixed on the edge of a nearby element. If the distance between elements is large enough, run arches from loops attached at random to a previously knit in arches. Despite the seeming simplicity of this method of joining the motifs requires a lot of skill, but the result is worth it: mesh adds, made "Irish", a unique lightness and ease.